On my recent trip to Scotland, I made it a point to visit some of the museums in Edinburgh. 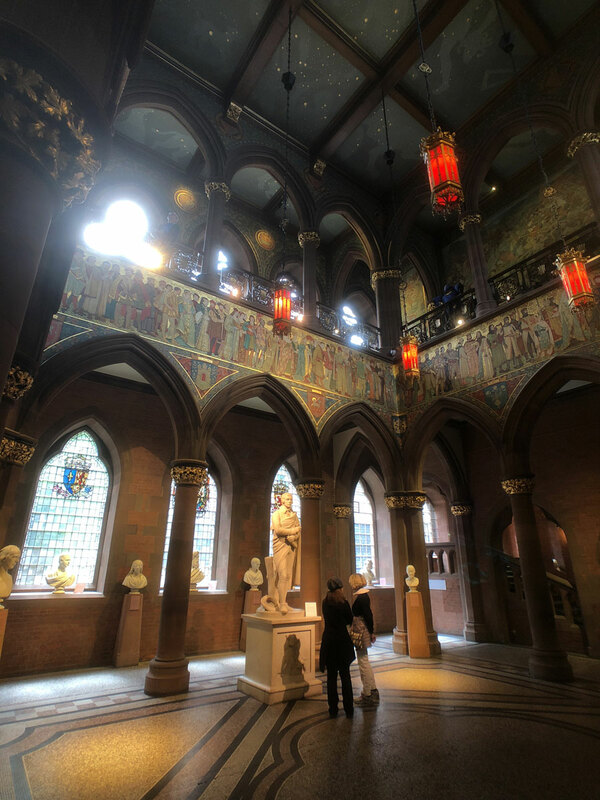 The Scottish National Gallery and Scottish National Portrait Gallery were two venues that really stood out. The Portrait Gallery featured a fascinatingshow by Victoria Crowe. The collection revealed a biographical narrative to portraiture. I found the work interesting because of the attention it paid to a story beyond a single portrait or moment in time. The people in the paintings were all connected to the artist, so she was telling her story, in addition to theirs. The show made me think about the level of depth needed to provide the story for each painting. The concept of stories within my own work continues to evolve, so the show sparked a lot of thought into my own future as an artist and story-teller. The National Gallery featured great work from artists I tend to gravitate to, such as John Singer Sargent, Monet, and Pisarro. Though I hadn't been previously interested in Flemish painters, something clicked for me and the paintings on display really spoke to me. Vermeer and Rembrandt, were masters at light and shadow - nothing new there. I was struck, however, by the level of detail so brilliantly demonstrated through the work of such masters as Rubens and Van Dyck. The intricracies of paint application was a great complement to the detail of ideas demonstrated in the portrait exhibit. The level of detail in both areas is something I've been more cognizant of within my own art and will continue to explore. The candy-man inspected the work I had just placed on the easel, hands clasped behind his back. I opted to begin the private viewing with work from my ‘Scapes series; a body of work less descript than my other paintings in terms of content and more focused on energy and color. He spent a few moments examining the work along with my friend who brought him in hopes of turning me on to a new collector. “Lobby art,” he flatly commented. There was a time when I would have thanked him for coming and promptly asked him to leave, but I held my tongue. He took a step closer to the painting, head moving from side to side as he scanned the horizontal format of the work. “Are those letters in there?” he asked. He remained fixed on the work with no acknowledgement of my reply, leaving me wondering if he even heard anything I had just said. “Do you like sushi?” he asked suddenly. “Excuse me?” my brow raised at the absurdity of his question. “Because I think I see it written right here,” he said pointing to an area in the left portion of the sky. Indeed, I could see an “S” shaped brush stroke, but thought it was a reach to spell out the rest of the word. It was certainly never my intention and I couldn’t get over the fact that he would really think I would put subliminal advertising for fish into my work. I was beginning to think the candy-man was trying desperately to hit upon some gold nugget of knowledge to stroke his ego, but he was reaching too far and his commentary was awkward at best. I bit my lip and remained silent. He continued to grasp for details, occasionally making comments to my friend as I accelerated the rotation of works to put our forced meeting to an end, fully aware he didn’t much care for my art. All the while, he continued making vain attempts to guess the motives behind my paintings. These were presented not as questions, but through cool assertions as if he had done the work himself. Eventually, he was able to say something complementary about one of my older works. He was intrigued by the cubist approach in the composition and soon revealed that at one time he had painted. He went on to explain how he had set aside his creative ambitions to pursue his own candy company. It seemed to me, his stifled creativity was coming out in the form of criticizing others. Once I realized that, I began engaging him through his perceptions of art and sure enough, he softened up a little. By the time he left, I felt we had reached a common denominator, though I knew this mutual appreciation would never result in a sale… and I was fine with that.